Teaching at the high school level grants the opportunity to directly influence the academic and personal lives of students during their formative years. Career paths in secondary education are not limited to working in the classroom. Online secondary education degrees — at the undergraduate and graduate level — can prepare educators for positions in areas from curriculum development to special education instruction. Read on to learn about online degree options, coursework, licensing requirements, and employment options in the field. Pursuing an online degree in secondary education guides students towards beginning a career teaching at the high school level, and does so without interfering with the student’s already busy schedule. Online learning allows students greater autonomy in managing their academics and is an excellent option for students with extracurricular obligations such as work and family. To help students find the best program, we’ve looked into each institution offering these degrees and ranked them based on their student success rate, cost, and student services. 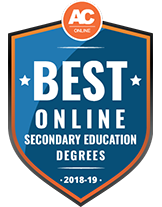 Look below and check out the top online secondary education programs for 2018-19. Valley City State University, located in Valley City, North Dakota, offers several bachelor's degrees designed to lead to careers in secondary education that can be earned online. Specific majors include business education, career and technical education, English education, history education, social science education and technology education. Coursework can be completed fully online, but some degrees include field experience elements that students must complete with approved education providers in their areas. For example, business education majors must complete their 12-week student teaching field experiences in secondary classrooms. All degree programs are nationally accredited and meet requirements for North Dakota teacher licensure, and most other states accept VCSU teacher education graduates for required licensure. Students outside of North Dakota are advised, however, to contact the appropriate licensing boards in their states to confirm that a VCSU education degree will meet all licensing requirements. All VCSU online students pay the same low tuition rates as North Dakota residents regardless of where they live. Established in 1963, The University of Central Florida is public state institution based in Orlando. Its online program in technical education and industry training is designed to produce graduates who can find successful careers in middle or secondary schools, correctional institutions, post-secondary adult technical institutions and community colleges. UCF graduates also move on to hold various instructional or training positions in business or industry. Students in the program partake in a required mentored internship course that is built around their specific professional goals. The internship takes place over 1 or 2 semesters and is the only in-person requirement for the degree; however, depending on the instructor, it may be possible for students to satisfy the internship course requirement remotely, by acting as an assistant teacher for web-based courses. Students may transfer credits toward their degrees at UCF; application requirements and transfer credit limitations depend on how many credits you already have completed at the time of your acceptance to UCF. The University of Wisconsin-Stout is a public university with 4 undergraduate majors focused on preparing students for teaching careers in secondary education. Students can pursue a Bachelor of Science degree with a specialization in family and consumer sciences education, marketing and business education, special education or technology education. All of these degrees may be completed entirely online, and the marketing and business concentration also has an additional hybrid option. The bachelor's degrees require either 120 or 121 credits to graduate. Some concentrations at UW-Stout require a 2.75 GPA or higher to remain in good standing. Graduates of these programs should be able to secure teaching positions at the middle school and high school levels, as well as in special education and vocational programs. Programs are designed to meet licensure requirements in the state of Wisconsin. In most cases, incoming students may transfer credits toward the general education requirements if the credits were earned at an accredited institution. 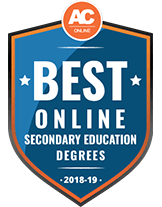 At Mayville State, aspiring teachers can complete the Bachelor of Science in Education with a specialization in mathematics education program entirely online. Students can attend either part time or full time, and should finish their degree ready to teach math at the secondary level. Courses are synchronous and taught using the cohort style, so that students work along with their classmates, collaborating on assignments and class discussions, and starting and finishing classes at the same time. Students majoring in secondary education must also choose a minor concentration in business administration, special needs, general science, library media and information science, or accounting. If you plan on taking classes during the summer semester, you can finish this education degree in 8 semesters or about 3 years. A total of 128 credits are required to graduate, but only 30 credit hours at the 300/400 level must be completed at Mayville. All other credits may be transferred from accredited colleges if the courses align with the major and are approved by Mayville. Established in 1899, Northern Arizona University is a public research institution that offers a variety of online education degrees. Distance learners can earn bachelor's degrees in career and technical/occupational education, elementary education, special education and early childhood education. All of these fully online bachelor's programs require 120 credits to graduate. The occupational education program allows students to transfer up to 90 credits from another accredited programs; the remaining programs accept up to 64 transfer credits. Depending on your major and focus area, you may be able to earn a certificate in an additional specialized area, such as special education or early childhood education. NAU graduates with degrees in education can find teaching positions with high schools, middle schools, vocational programs and tutoring services, and as curriculum specialists. Students may also work in the field more generally, pursuing non-teaching roles in the education system. These programs do not lead to state teaching certification. Judson College offers a Bachelor of Arts in Secondary Education with 2 concentrations focused on teaching grades 6-12: secondary English/language arts and general social studies. All online courses at Judson are taught in the cohort, synchronous style, and may be started during any of the 3 semesters each academic year. As a result, distance learners start and finish classes at the same times as on-campus students. Judson utilizes the Moodlerooms learning system to keep all students on task and working through the same course content in a collaborative and participatory way. All distance learners must maintain a 2.75 GPA throughout the program, and must finish their general studies courses before taking major-specific education courses; the full degree takes between 2 and 4 years to complete. Judson only certifies Alabama candidates, and all of the school's students are placed in Alabama schools for required field experiences and clinical practice observations. For transfer students, a maximum of 64 semester credits may be transferred from a 2-year college. Those holding an associate degree in a parallel field of study automatically satisfy the general education core requirements at Judson. The Hobe Sound Bible College is a Christian college in Florida with roots in the Methodist church. It offers a bachelor's degree in secondary education that can be earned online after completing 129 total credit hours. No on-campus work is required. Students work toward their degrees by exploring a variety of required bible-related, general education and professional education courses. You must choose from one specialized subject area; the selection may change from year to year. In most cases, available concentrations include English, social studies, biological science and physical science. Any additional specializations offered at HSBC require the same amount of credit hours for graduation. All students must also complete 2-3 non-credit courses, including assistant teaching. Hobe is accredited by the Association for Biblical Higher Education, and credits usually transfer to major theological institutions of higher learning. Incoming transfer credits of a "C" or higher may be counted toward your degree. Depending on whether students have transfer credits, most are able to complete the degree in 4 years. Graduates with a degree in secondary education go on to be teachers in various roles at both Christian and secular schools. At Chaminade University of Honolulu, a Roman Catholic institution founded in 1955, distance learners can complete a Bachelor of Science in Secondary Education degree entirely online. Full-time students at Chaminade can complete the required 120 credits in 4 years, and should finish prepared for licensure in English, math, science or social studies. Upon graduation, students are licensed to teach grades 6-12 in their core content subject and to work in middle and secondary schools and other educational organizations. You should consult with your academic adviser when selecting elective courses for your desired licensure path. This degree and the accompanying licensure permits you to teach in Hawaii and most other U.S. states. Students applying to Chaminade should have a minimum GPA of 2.0, and should submit a personal statement along with transcripts for any previously earned college credit. For transfer students, up to 90 semester hours of credit may be applied to a bachelor's degree. Ferris State's Bachelor of Science in technical education ProMoTed is a 12-month degree-completion program that's offered in a hybrid format, combining online coursework with a number of in-person learning activities and experiences. Students interested in this program must fulfill 1 of 2 requirements prior to beginning their studies: Earn an associate degree with a minimum of 40 credit hours in an occupational major with a minimum 2.5 cumulative GPA, or earn an associate degree or 56 transferrable credit hours that include intermediate algebra and 2 semesters of English composition. Program participants begin their study with a face-to-face, 2-week, on-campus summer session, followed by fall and spring semesters consisting of online coursework and in-person preteaching experiences. Students then return to campus for a second 2-week, face-to-face intensive summer session. Following completion of all other degree requirements, students are enrolled in an in-person directed teaching experience and seminar to finish their studies. The B.S. in technical education ProMoTeD degree leads to an Interim Occupational Certification through the Michigan Department of Education, and graduates may find career opportunities in industry and vocational education, as well as secondary education. However, this degree does not lead to secondary teacher certification without completion of an academic major and minor (such as math, English, etc.). For distance learners interested in both business and education, Fort Hays State University offers a dual online degree -- the Bachelor of Science in Business Education Concentration in Business Teacher Licensure and Bachelor of Science in Secondary Education. Established in 1902, FHSU is a public institution with over 15,000 students located in Hays, Kansas. This dual degree prepares students for careers teaching business-oriented classes in both middle school and high school. Graduates may also move on to careers as marketing or computer skills teachers, curriculum developers or advisors in organizations such as the Future Business Leaders of America, Business Teachers Association or the Distributive Education Clubs of America. Including general education classes, this dual degree program requires 164 credits for graduation. Incoming students may transfer an associates degree or up to 45 credit hours toward the dual B.S. Full-time students can expect to spend 5 years or more completing all graduation requirements. Founded on the principles of creating educational programming for busy, working students, Western Governors University is a respected institution for online teacher education. Through WGU's Teachers College Online, students have 4 bachelor's options among secondary science education degrees: secondary biological science, secondary chemistry, secondary physics and secondary earth science. There is also a secondary mathematics education degree option. Depending on the program, students can complete the program within 16 to 48 months. Students may also transfer credits from their associate degree. The programs require between 39-44 courses to complete depending on the degree and include courses in foundations of teaching, pedagogy and demonstration teaching as well as field experience courses. Additional coursework includes subject-specific content courses such as mathematics, chemistry or physics depending on the requirements for the specific degree. The University of West Florida strives to create tomorrow's leaders through an array of programs offered both in-person and online. For future leaders in education, UWF offers the Bachelor of Arts in Exceptional Student Education program within the College of Education and Professional Studies. This degree can be achieved completed completely online (aside from the field experience) and equips students for the Professional Florida Educator's Certificate in Exceptional Student Education (K-12) including Elementary Education (K-6) with endorsements in reading and English for Speakers of Other Languages or ESOL. The major requires 72 credits to complete in addition to the university's general education requirements. Required courses include Applied Foundations of Education, Literacy for the Emergent Learner, Teaching English to ESOL Students and Curriculum for Teaching Students with Severe Disabilities. Students pursuing the degree are also required to complete 2 capstone field experiences of 100 supervised student teaching hours in a K-12 classroom. The second capstone is specifically focused specifically on teaching to English language learners. The bureau of labor statistics provides the following data about job growth in the Field of Scondary Teaching. As well as the following national median salary data for several different careers in the field of Scondary Teaching. Below is a sample career milestone map showing key accomplishments of someone who earned an online secondary education degree. University-based teacher preparation programs combine academic instruction and clinical experiences that align with state-based standards and guidelines. Increasingly, these programs are moving online, providing students with alternative options for completing a secondary education degree. Below is an overview of the learning experience for students earning online secondary education degrees. Student-teaching practicums are a central component of teacher preparation programs. Students are required to complete a set number of hours of field experience in a public or private school. Some online programs, which may have agreements in place with local school districts, arrange site placements for students. However, some programs may require students to find a local site and receive approval for the location and supervising instructor. Some institutions may even require a supervisor site visit to check on the student’s progress. Online learning allows students to complete their degree in a flexible manner. Instruction may be delivered in either asynchronous (self-paced) or synchronous (real-time) formats. Many programs follow an asynchronous format, meaning students are not required to attend their classes at a specific time. Online programs use learning management systems. Students use these systems to access course materials, complete weekly assignments, get reading materials and hold course discussions. Like campus-based programs, online programs include peer-to-peer interaction — just via a different medium, with interaction fostered through video conferencing, phone calls, chat rooms, online bulletin boards and email. Each online program establishes its own list of technology requirements. Students should have a computer with a reliable, high-speed Internet connection, and the latest versions of Web browsers (e.g., Firefox) and related hardware, such as microphones and speakers, are typically recommended as well. Public and private high schools in the United States require their teachers to hold valid state teaching licenses. Individuals interested in teaching at the secondary level have several academic avenues to licensure. Some programs exist at the undergraduate level, preparing teachers to enter the classroom with a bachelor’s degree. Other universities offer master’s and postbaccalaureate programs designed to prepare individuals with bachelor’s degrees in a non-education field to qualify for licensure. It is important to note that the definition of secondary education varies from state to state and may start anywhere from grades six through nine and continue to grade 12. Prospective students should contact their state board of education to learn more about teaching-preparation programs and licensing at the secondary level. Below is an overview of the major types of degree programs in secondary education. Available at community colleges, two-year associate degree programs in secondary education are stepping stones to a four-year bachelor’s degree and a teaching license. The curriculum introduces students to fundamental concepts in education, including pedagogy and theory, curriculum and instruction, diversity, and current trends in the field. Students complete core and general coursework in the first year and transition into coursework in an endorsement area (e.g., social science, mathematics, English) during the second year. Most programs require 60 credit hours to graduate and may also include a student-teaching practicum. Depending on the course of study, students may be qualified to teach either grades 7-12 or 9-12. Bachelor’s degrees in secondary education are considered teacher preparation programs, designed to provide students with the knowledge, skills and experience to qualify for a teaching license. In these programs, students gain experience planning effective classroom instruction, learn about best practices in classroom management, study evidence-based educational research and assessment, and gain familiarity with utilizing technology to support student learning. During the first two years, students take general education and core curriculum courses. During the second two years, they move into teacher preparation topics and classes in an endorsement area. During their studies, students may complete in-person classroom observations and one to two semesters of student teaching under the supervision of a licensed teaching professional. Credit hours vary, but most programs require between 120 and 128 hours to complete. Master’s degrees in secondary education prepare teachers for initial licensure or professional advancement. The major goals of these programs are broad in scope. For example, most programs aim to provide teachers with advanced knowledge of teaching theory and modalities so they can learn how to design an effective curriculum, how to assess student performance, how to address the needs of a diverse student body, and how to leverage technology in the classroom. Prospective students may select from two different tracks: Master of Education (MEd) and Master of Arts/Master of Science (MA/MS). The MEd is designed for both licensed and unlicensed educators and offers a curriculum focusing on education practices and field-based learning experiences that can be applied directly to the classroom. Many MEd programs cover specialized areas of study, such as special education, educational leadership, and curriculum and instruction. An MA/MS includes graduate study in education and a secondary education endorsement area (e.g., history, language arts) and generally requires a thesis. The central focus of MA/MS programs is equipping educators with an expert-level knowledge of education as a formal discipline, which requires studying foundational theories, pedagogy and assessment in their subject area. Doctoral degree programs in secondary education are terminal degrees, representing the highest level of academic achievement in the field. These programs target individuals interested in theory and research who want to develop professionally, transition into leadership positions or pursue careers as academics. Generally, students must complete between 50 and 72 credit hours of study to earn their degree, which includes comprehensive examinations and an original dissertation. There are two distinct tracks at this level: Doctor of Philosophy and Doctor of Education. Doctor of Philosophy programs are designed to develop researchers who will examine and explore educational theory and practice. Such researchers are responsible for driving advancements in educational administration, pedagogies, inclusive education and teacher preparation. Some colleges of education allow students to further specialize their doctoral studies in areas such as educational leadership, teaching and curriculum, special education or a pedagogical area such as mathematics or science education. PhD graduates traditionally pursue careers as college faculty members, administrators or curriculum coordinators. The Doctor of Education is for licensed educators who want to engage in coursework that deepens their knowledge of education as a practice while delving into a specific content area. The degree is professionally oriented, aimed at returning educators to their schools armed with the ability to translate their knowledge and understanding of the latest research into effective classroom strategies. EdD students may specialize in topics such as teacher leadership, curriculum and instruction, and educational administration. Secondary education master’s degrees generally require 60 credit hours of full-time study to complete and may include a student-teaching component or thesis. Graduate certificates are post-baccalaureate programs for individuals who have completed a bachelor’s degree and would like to finish coursework for initial licensure as an educator in their state. The curriculum and core requirements in these programs vary widely — some only require 15 credit hours of study, while others include up to 45 credit hours of coursework. Graduate certificate programs include core curriculum and endorsement area study as well as field learning experiences. The EdS is a post-master’s degree that allows students to complete graduate studies that develop and advance their knowledge and competencies as educators. Some teachers choose to use an EdS as a bridge to future studies at the doctoral level. Typically requiring 30 to 33 credit hours, these programs may be completed in two to three years of study. A specialist degree curriculum is designed to build upon a licensed secondary teacher’s endorsement subject area but also offers an opportunity to specialize in secondary fields such as literacy, special education, curriculum and instruction, and gifted education. Most EdS programs can be completed almost entirely online but generally do include a seminar and an in-person research component. Combining classroom-based instruction with real-world teaching experiences, online secondary education degrees are designed to enhance the skills of teachers in any discipline. Below is a list of common coursework found in online secondary education programs. In this course, students receive an introductory overview of secondary education, learning about the educational system, the role and responsibilities of secondary educators, and classroom instruction. This course covers core concepts in education, including teaching methods, principles of learning and instruction, educational psychology, classroom management, cognitive development, and modern models of instruction. Students are introduced to educational psychology, studying both theoretical concepts and practical applications related to teaching, instructional development and teacher-student relationships. This course offers secondary teachers an understanding of human development and how social, environmental and hereditary factors impact students’ ability to learn within a school environment. In this class, students are introduced to cultural diversity within educational settings, discussing contemporary trends in K-12 education and learning how to work with students from culturally diverse backgrounds. There are multiple considerations when it comes to selecting an online versus a campus-based program of study. Below are seven factors to think about when reviewing online secondary education degrees. Is the program accredited?Students should attend online secondary education programs that are accredited by the Council for the Accreditation of Educator Preparation (CAEP). Graduating from an accredited program is a teaching licensure requirement in most states. How long does it take to complete the program?Undergraduate programs can last beyond four years of study because they include student teaching, while master’s programs may be completed in as little as two years. Does the program provide a research-based curriculum that is founded on current pedagogical theory?Ensure that the college to which you are applying is accredited – while employers understand that more candidates are receiving their degrees online, it is still important that degrees were earned through reputable institutions. What are the entrance requirements? Students should review entrance requirements, from GPA to prerequisite coursework. How are field experiences handled? Online students are required to complete classroom-based practicums. Some programs may have agreements with local school districts, others may require students to get approval for their local placements, and some may require students to attend on-campus training sessions. Does the program satisfy licensing requirements?The Department of Education in each state maintains a list of approved programs that satisfy licensing requirements. Prospective students should ensure their targeted program is state-approved. This is especially important for students attending an online program based in another state. Does the program prepare students for licensure examinations? To earn a teaching license, graduates must successfully complete state-based knowledge assessments. They should research how program alumni performed on these tests. Accreditation is a voluntary quality assurance process conducted by third-party, nongovernmental organizations. There are two types of accreditation: institutional and programmatic. For education, the primary programmatic accreditor is CAEP, the Council for the Accreditation of Educator Preparation (formerly TEAC and NCATE). CAEP reviews and accredits schools, colleges and departments that offer teacher preparation programs. Accreditation is valuable for two major reasons. First, it validates the quality of the curriculum and overall program, verifies that teachers understand their subjects, and ensures students receive appropriate training that allows them to teach effectively. Second, state licensing agencies typically require educators to have graduated from an accredited program. For more information, visit our page on the overall accreditation process. Created for new and experienced teachers alike, master’s degrees in secondary education help teachers develop the skills necessary to become leaders both in and outside of the classroom. The map below is a sample timeline for a certified high school teacher who wishes to return to graduate school to complete a Master of Arts in secondary education. Returning to graduate school is a big decision as it has long-lasting ramifications for teachers personally, financially and professionally. Graduate school is not for everyone, so prospective students should be prepared and ready for the rigors of advanced academic study. Furthermore, gaining entrance to master’s programs is competitive, but the following steps may help applicants as they prepare to go back to school. Demonstrate commitment to educationDesirable candidates must demonstrate their contributions to student learning. This can include not only taking on the standard teaching requirements but also serving on school committees and coaching sports teams. Make connections and networkStudents interested in specific programs can connect with alumni from the program. Making connections, visiting campus (if possible), and meeting with faculty members and graduate directors can all make a real difference when it comes time to review applications. Take a GRE prep courseAlthough not required by every master’s in secondary education program, the Graduate Record Examination (GRE) is still a reviewed component by many application committees. Programs typically have a cut-off score, so students should prepare for the test and retake it if necessary to raise their scores. The Bureau of Labor Statistics projects 6 percent job growth nationally between 2014 and 2024, although that number can be higher or lower based on location, local and state budgets, and demand in specific school subjects. Like job growth, the earning potential for high school teachers also varies from state to state and even between school districts. Numerous factors influence pay, including teacher experience, education level and school location. Nationally, the median salary for high school teachers is approximately $56,000, but ranges from the upper $30,000s to nearly $90,000 per year, according to the Bureau of Labor Statistics. Becoming a teacher means not only completing a bachelor’s degree and teacher preparation program, but also meeting certification and licensing requirements. Future teachers must earn a teaching license and subject endorsement to teach at the secondary level. They may also choose to further their knowledge and skills through credentialing programs. Below is an overview of the secondary school licensing process and opportunities for professional certification. Although each state department of education sets regulations regarding licensing of secondary school teachers, the basic requirements are similar. Prior to enrolling in any teacher preparation program, prospective students should contact their state department of education to learn about the licensing and certification requirements and process. Below is a checklist of common licensing steps for secondary school teachers. Developing professionally is one way high school teachers can earn higher salaries or pivot into leadership positions. Beyond a graduate education and post-bachelor’s/post-master’s certificates, the certification and credentialing options for high school teachers is somewhat limited in scope. The two major providers of high school credential programs are the National Board for Professional Teaching Standards and the American Board for Certification of Teacher Excellence. In addition to being recognized as a professional credential, a certification from the American Board is recognized as an alternative form of teacher certification in 11 states. To earn American Board certification, candidates must complete a bachelor’s degree and pass two examinations: one on teaching knowledge and one in their subject area. Teaching is a wide-reaching and rewarding occupation that allows for an opportunity to make a difference in the lives of different student populations, from toddlers to adults. Below are three potential academic avenues open to those who are not interested in secondary education but who want to teach. The goal of early childhood education programs is to prepare professionals to work with children and families in infant-toddler programs, Head Start facilities, preschools and child care centers. Elementary education degree programs are designed to prepare students to work in K-6 educational programs by covering an assortment of subject areas, such as science, social studies, performing arts and mathematics. Adult education degree programs prepare students for careers in adult literacy and basic education, professional education, community development, or even cooperative extensions.